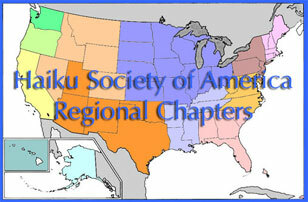 This region includes Delaware, New Jersey, New York, and Pennsylvania. and New York Poetry Festival at Governors Island. Poets published by four small presses (Shabda Press, Many Voices Press, Hummingbird Press, & FootHills Publishing) in the Coast to Coast Poetry Press Collective gather for the first time in New York City to share their poetry. The presses represent a diversity of poets, ethnicities and cultures from the Pacific Ocean to the Atlantic Ocean and around the world. The presses also represent a diversity in publishing, creating books that are unique to their aesthetics from hand-bound books to books printed locally and sustainably. Poets reading will be traveling from states including California, Colorado, Michigan, New York, Washington, and from Japan. Join us in celebrating acclaimed Japanese Poet Mariko Kitakubo's debut U.S. release of her full-length collection of tanka, Indigo, acclaimed haiku poet Deborah P. Kolodji's release of her first full-length collection of haiku, Highway of Sleeping Towns, David Giver's second collection of poetry, I Still Remember the Last Time You Held My Hand, Native American mixed-lineage poet Susan Deer Cloud's just-released book of poetry, Before Language, and Emily Johnston's new book of poetry, Her Animals. Featuring Susan Deer Cloud (NY), Michael Czarnecki (NY), Mariko Kitakubo (Tokyo, Japan), Deborah P. Kolodji (CA), Joan I. Siegel (NY), Teresa Mei Chuc (CA), Drew Dillhunt (WA), Jennifer Clark (MI), Doren Damico (CA), Emily Johnston (WA), Heather H. Thomas (PA), R.G. Evans (NJ), J.C. Todd (PA), George Wallace (NY), David Giver (GA), Alan Casline (NY), Alifair Skebe (NY), Kathabela Wilson (CA), and CX Dillhunt (WI). This event is made possible through the Poets House Literary Partners Program. Poets representing the Coast to Coast Poetry Press Collective at the July 30th reading at the Poets House will also be reading poems (including haiku and tanka) on July 31st at 2:00 pm on the Algonquin Stage, during the New York Poetry Festival. Rita Gray lives in Manhattan and works with children as a teacher and play therapist. She has published four books for young children: Nonna’s Porch (Hyperion, 2004), The Wild Little Horse (Dutton, 2005), Easy Street (Dutton, 2006), and Mama Mine, Mama Mine (Dutton, 2008). She also edited an upcoming poetry anthology for children for Charlesbridge entitled One Big Rain, including haiku translations by William J. Higginson. 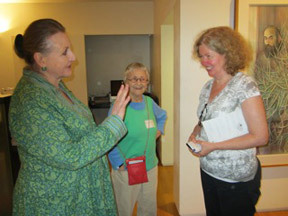 Ellen Peckham and Rita Gray engage in a spirited discussion as miriam chaikin observes and enjoys the banter at the June 2011 event.